Are you ready (and prepared) to go ice fishing? Several parts of Michigan should hopefully have ice in the coming weeks, thus providing anglers with an opportunity to go fishing. Will you be joining them? Then it’s time to get prepared to head out safely on the ice! You’ll need some special equipment if you head out ice fishing. Take stock of your spud/auger, skimmer, shelter and apparel to have an enjoyable experience out on the water. Pick your preferred ice fishing technique and the species you wish to target and brush up on your skills. Whether that is hook-and-line fishing for bluegill, sunfish, perch or crappie; using tip-ups for northern pike, walleye or trout; or spearing for northern pike, muskellunge or sturgeon. You should always stay safe when heading on the ice. These five tips can help: 1) Never fish alone; 2) Tell someone where you are going and when you expect to return; 3) Always test the ice with a spud; 4) Take the appropriate emergency items, such as a lifejacket and ice picks; and 5) Take a cell phone with you in case you need to call for help. Keep it in a plastic, sealable bag to make sure it doesn’t get wet. Want more information on ice fishing? Visit www.michigan.gov/fishing. Suckers have been given a bad rap. Michigan’s world-class fisheries are numerous and well-known. Michigan boasts exceptional fishing for many of America’s top game fish – muskellunge, smallmouth bass, walleye and brown trout, among them – and is a popular destination for tournament fishermen seeking those species and others. Another popular fishery exists for some less heralded specimens as well, including one that is heating up right now as sucker fishing comes to the fore. In spring, many species of suckers head upstream to spawn in the state’s rivers and creeks where plenty of anglers are ready, willing and able to challenge them. “On some streams, sucker fishing produces more angling effort than anything else,” said Department of Natural Resources fish production manager Gary Whelan. Thought (incorrectly) by some to be “trash” fish, suckers have been given a bad rap. There are those who believe they compete for food and space with more desirable species. They’ve also been blamed for eating the spawn of other species. However, there appears to be no scientific basis for these beliefs. Suckers have evolved side-by-side with most species of game fish and seem to coexist quite nicely with them. Most species of suckers demand relatively high water quality; in fact, excellent sucker fishing is available in some of the state’s premier trout streams. Whelan said that suckers are an important component of the food chain, serving as prey for numerous species, especially northern pike and muskellunge. 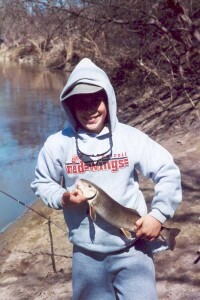 Michigan boasts 15 members of the sucker family (Catostomidae), including the endangered Western creek chubsucker and threatened river redhorse. These spirited fighters are generally medium-sized fish – closely related to minnows – though some of them grow to significant sizes. The state-record black buffalo, for instance, weighed 33 pounds, 4 ounces. bigmouth and black buffalo; quillback carpsucker; and longnose, northern hog and white suckers. A 2-pound longnose (22 inches for the catch-and-release category) or a 3-pound white sucker (20 inches) will earn a fisherman the DNR status of Master Angler. Whelan said that suckers have an inferior mouth positioned to optimize feeding on the bottom. For the most part, suckers feed on aquatic insects, crustaceans and worms, though some species prefer feeding on snails or algae. Most suckers will win few beauty contests. They tend to be drab in color—gray to mottled brown—though male longnose and white suckers develop a rose-colored lateral band during their spawning runs. The exception is the redhorse, which is a bright silvery color with orange or red fins. Often, while steelhead anglers are wading or boating during the spring run, they encounter sucker fishermen – often whole families – sitting on the bank, rods propped in forked sticks, fishing in the same stretches of stream. Generally, sucker fishing is best in places where there is a break in the current: around obstructions or below riffles. Deep holes are popular with sucker anglers. That said, anglers can make sucker fishing as complicated as they like. Fly fishing for suckers is becoming more popular all the time. Suckers will willingly take nymphs, yarn flies or even streamers fished on the bottom. They can be as selective as trout, and many a trout fisherman has been disappointed when he discovered the big brown he thought he’d hooked turned out to be a big white sucker. Anglers are divided on suckers as table fare. Some turn up their noses (no doubt because of the trash fish/bottom-feeding reputation), while sucker aficionados swear by them—especially in spring when their flesh is firm. Suckers are bony fish and anglers have devised a number of methods for dealing with the bones. They are popularly pickled, canned, smoked or deep-fried. Folks who deep-fry them typically score the bones to make them easier to eat. Some people grind them and use the flesh to make patties or fish cakes. “They’re good eating,” said Whelan, who says he’s eaten them pickled, fried and made into patties. There is a small commercial fishery for suckers, though they are primarily a by-catch of commercial fishermen targeting other species or being caught for the pet-food industry. They do not command a high price, as global competition in the fish market has driven down demand. Suckers may be taken with hand nets (of any circumference and handle length) from the Great Lakes, connecting waters and tributaries up to a half-mile upstream, March 1 to May 31 south of M-72, and April 1 to May 31 north of M-72. They can also be taken with dip nets (measuring no more than 9 feet by 9 feet) from Lower Peninsula non-trout streams from April 1 to May 31 and Upper Peninsula non-trout streams May 1 to 31. Spearing suckers is a popular pastime, too, legal on non-trout streams April 1 to May 31 south of M-46; April 15 to May 31 between M-46 and M-72; and May 1 to 31 north of M-72. Bows and arrows may be used as well as lights. In the Great Lakes and connecting waters, suckers can be taken by spear or bow year-round. The sucker fishery is one of the first to catch fire after the ice has melted, but by the time many anglers start thinking about fishing, the spring sucker run has already begun to fade. With the warm spring weather, anglers should be aware that smelt dipping is open on all waters at this time and anglers can take 2 gallons daily. Smelt can be taken by hook/line, hand nets or dip nets. For more information on fishing and where the smelt are running in Michigan, visit www.michigan.gov/fishing.